Our favorite harbinger of spring has landed in the market. There are numerous spring fruits and vegetables that are eagerly awaited by food enthusiasts; but our favorite is asparagus. Fresh-harvested domestic asparagus is as flavorful and affordable as it gets. 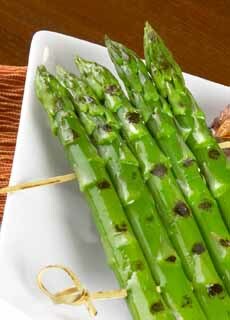 Bonus: asparagus has just three calories per medium spear, and contains no fat or cholesterol. A good source of calcium, magnesium, vitamin B6 and zinc. A very good source of copper, dietary fiber, folate, iron, manganese, niacin, phosphorus, potassium, protein, riboflavin, selenium, thiamin, vitamin A, vitamin C, vitamin E (alpha tocopherol) and vitamin K.
The season runs through June, so dig in. Asparagus officinalis was first cultivated more than 5,000 years ago in the eastern Mediterranean region. The oldest reference shows the spring vegetable on an Egyptian frieze dating to 3000 B.C.E. The ancient Greeks and Romans prized asparagus for its flavor, texture and alleged medicinal qualities. They liked asparagus so much that they dried it to enjoy after the short asparagus season ended. The oldest surviving cookbook, De Re Coquinaria by Apicius, believed to be from the late 4th century C.E., has a recipe for cooking asparagus. The vegetable gained popularity in France and England in the 16th Century. King Louis XIV of France (1638-1715) enjoyed asparagus so much that he had special greenhouses built to supply it year-round. No doubt Louis enjoyed it with with hollandaise sauce, a rich sauce made from butter and eggs. The first known recipe for hollandaise was published in 1651, in a cookbook by the great French chef François Pierre de La Varenne (1618-1678). 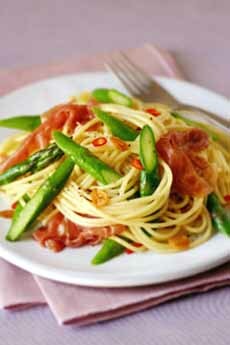 The recipe was for Asparagus in Fragrant Sauce (his original name for hollandaise). Early colonists brought the plant to America. Asparagus is a perennial plant, raised in furrowed fields. It takes about three years before the plants produce spears that can be harvested. The spears are cut by hand when they reach about 9 inches in length. The delicate asparagus plant needs a temperate climate and requires much hand labor in all phases of cultivation; hence, their higher cost. White asparagus is a special treatment of conventional asparagus, grown for its color. The spears must be grown under a layer of topsoil or in the dark without exposure to sunlight. Light would engender photosynthesis and the development of green chlorophyll. The growing technique was developed in France in the mid-1600s. If you come across fresh white asparagus and want to see if the extra cost is worth it, steam them with a bit of salt and taste their nuances before adding butter or another ingredient. You may or may not find a difference worth the money. Never buy bland, canned white asparagus. Here’s more about white asparagus as well as purple asparagus, a breed that is larger, sweeter and tastier than the conventional green types of asparagus. Purple asparagus was originally developed in Italy by farmers in the Albenga region of the Italian Riviera. It was first commercialized under the variety name Violetto d’Albenga. Purple asparagus retains its color if cooked briefly (blanching, quick sauteing), but reverts ti green with prolonged cooking. Look for firm stalks of a uniform width and a minimum amount of woodiness at the end. It doesn’t matter if they’re thick or slender: both are equally tender. But you need uniformity of size to cook them evenly. The tips should be tightly closed. Once they begin to separate, it means that the asparagus is older and won’t have the best fresh flavor. If your tips have begin to wilt, soak the spears in an ice bath before cooking. Vegetables wilt when they dry out. You can restore the moisture with an ice bath: Fill a bowl with water with ice cubes. Add the vegetables (cut as you plan to use them) and let them sit for 15 minutes or longer. Remove with a slotted spoon or tongs and drain on a cloth or paper towel and they’ll be crisp. Asparagus can be boiled, grilled, roasted, steamed, tossed into soups and stews, and eaten raw as crudités. Most cooking instructions tell you to hold a spear of asparagus in both hands and bend until it snaps at its natural break point (which is 1-2 inches above the base). That produces rough, uneven bottoms. We simply trim them with a knife as far as the green portion goes. Slice a 1/4″ piece from the bottom and chew it. You’ll know for sure if it will cook nicely. Trim that extra inch or so, keep the trimmings and use them in a scramble or other recipe. 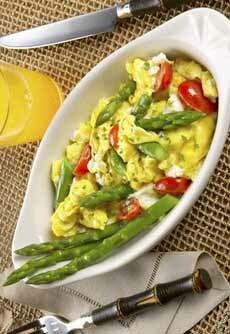 Asparagus Scramble (here’s the recipe from California Asparagus Commission). 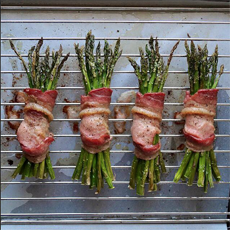 Asparagus-Bacon Bundles (this also works with green beans—here’s the recipe from Food Network). 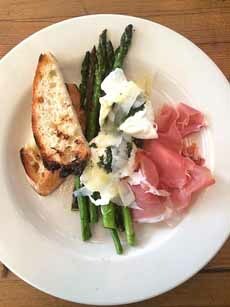 Burrata Salad With Asparagus & Prosciutto at Barbuto | NYC. 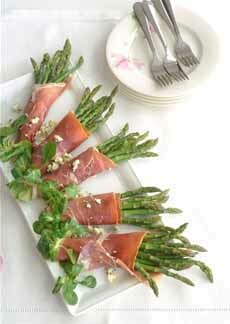 Ham & Asparagus Rolls With Blue Cheese (here’s the recipe from Castello USA). 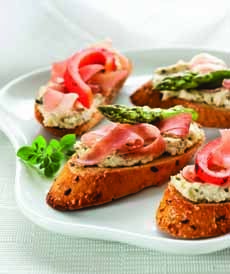 Asparagus Crostini from Nestle USA | WordPress. Use hummus or bean dip as the base.